The aim of this research carried out by Istituto Nazionale di Oceanografia e di Geofisica Sperimentale-OGS Trieste, was to apply several geophysical methodologies such as Earth Resistivity Tomography, Ground Penetrating Radar, and microgravity survey to detect cavities in karst area. A well-known cavity system was chosen as the test site, in order to verify geophysical data with a real situation. The results was really satisfactory, since the methods had a very good power of investigation and they has been complementary which other. The surveying lines location was carried out in collaboration with the “Civico Museo di Storia Naturale” of Trieste. The comparison of data highlight the potentiality of several methodologies and it has showed a good similarity of the results. Microgravity prospecting is particulary devoted to locate underground cavities and to obtain reliable information about the volume and the depth of the them. The anomaly's amplitude is usually very small, few tenths of mGal, therefore it is imperative achieve highly accuracy during the field work and during the data processing. The microgravity measurements were made with a LaCoste-Romberg mod. D with a ZLS feedback: the electronic feeback system provides a valuable tool to eliminate the periodic errors of measurement screw and transmission, these kind of errors rise an amplitude of 3-5 mGal, in fact the electrostatic force acts on the lever system in order to restore (or null) it to the zero position and keep it there and the measurement screw is not moved working within the feedback range. The area surveyed covered over 4000 mq; the station separation was 5 m in the surrounding areas of the main cavity and 10 m apart in the far areas in order to detect the regional gravity field; two bases were selected as points belonging to the first order net. A total of 150 stations has been measured, according to the loop method in order to check, roughly every hour, the drift behaviour. The closure’s errors lie in a range between ±0.002 mGal. Besides over 25% of the stations has been repeated in order to check the quality, the accuracy and repeatability of the LCR data: the results indicate that roughly 80% are in the range ±0.002 mGal. The stations’ elevations have been carried out with a Leika level with an accuracy less than 0.5 cm, and the position with a total station with an accuracy less than 10 cm. The data elevation set has been obtained from a digitized map on the scale 1:5000 and from an extra height set data collected in the field in order to produce an accurate digital terrain model to be used for the inner terrain correction. For the inner zone (from 0 to 50 m) the prism size was 2.5 m, from 50 to 1000 m was 10 m; beyond 1000 m the terrain correction was constant. The anomaly map after these corrections and after the removing of the regional trend by means of a polynomial surface of 3rd order is presented. From the pattern anomaly it is very clear the presence of roughly circular negative anomaly with a minimun (-0.060 mGal) located in the position X=2424.498 and Y=5062.079, whose corresponds a deficit of mass, applying the Gauss theorem, about 335 tons. ; besides this anomaly shows an elongation along the NW-SE direction, other area with a negative trend is located in the SE border with a minimum of –0.040 mGal. To collect DC data, a Syscal R2 equipment by Iris Instruments was employed. A multinode lines survey with 32 electrodes were disposed. The electrode spacing was 4 m and the line was just over the cave system.A polar dipole-dipole geometry array was used because it yielded a much more detailed image of the subsurface, which is essentially composed of a highly inhomogeneous overburden and a bedrock. The apparent resistivity data were inverted using the RES2DINV software, selecting the robust inversion option because of some noise amount on the data, due to shallow inhomogeneities and sometimes to difficult ground contacts. The amount of information on the cave system and an existing detailed topographic survey are a test for comparing the resistivity model with the real situation. The limestone resistivity is between 1000 and 5000 ohm/m, higher values indicate void presence, lower unconsolidated deposits and soil. The model detects an high resistivity body between 48 and 68m at a depth of about 4 m and a lengthened high resistivity between 76 and 100m that corresponds to the cavity n. 3876. On the right part of the model, the low resistivity values indicates the presence of unconsolidated deposits due to a typical karst morphology The high resistivity body between 48 and 68 seems define a unique cave instead of two different caves, as suggested by the Civico Museo di Storia Naturale of Trieste. The model indicates that the bedrock is close to the surface and the soil has a maximum thickness of 2,5 m.
A GPR investigation was carried out between the two well-known caves. 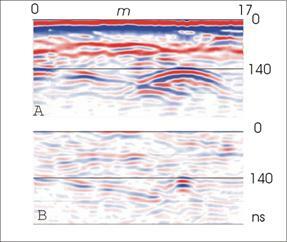 The GPR grid was a pseudo three-dimensional acquisition: a total of 22 parallel profiles up to 20 m long with the separation between adjacent profiles of 2 m and intertrace of 2 cm. Three perpendicular profiles were acquired too. Then georadar data were recorded over 800 mq area. The surface survey was performed using a georadar SIR2000-GSSI system equipped with monostatic shielded antennas having nominal centre frequency of 70 MHz (SUBECHO). After several antennas tests, we chose 70 MHz because this frequency permitted a good penetration and a reasonable resolution for our study. During acquisition the transmitter was carried coupling to soil to avoid reflections from air events. Every trace had 1024 samples with a sample interval of 683.5 ps, therefore a time window of 700 ns. 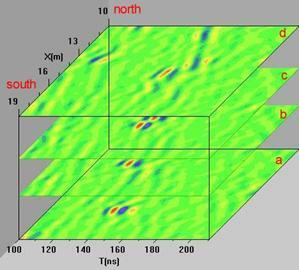 Data showed a good Signal/Noise ratio, therefore the multi-fold technique was not necessary.Whole dataset was processed with GRADIX software. A first shallow continuous reflector is visible on all sections: it’s the discontinuity between a soil and limestone. The thickness of soil varies from 150 cm to few centimetres. In many profiles we can see very well the geological stratification of the area investigated. A large variety of scattered signal supposes the probably presence of materials with several cracks and fracture zones. In several lines there was a strong hyperbolic-shape signal. The f-k migration with a velocity of 10 cm/ns focused very well the energy into a spot and has clarified the location and geometry of this signal. To estimate the average velocity of the investigated site we used wide-angle reflection and refraction (WARR) method. We collected a few WARR and then we calculated georadar velocity with semblance. The velocity range of reflections checked was stable between 9 and 10 cm/ns, a typical characteristic velocity of limestone. In this case the resolution obtained is 50-60 cm. Four adjacent migrated sections are displayed into cuboid. The interesting target is 1.5-2 m width and 7 m deep. We can see that signal goes to the bottom and moves from south to north through section (a) to (d). Probably it is a cave that connects the two cavities 3875 and 3876. This signal is not visible on all lines and therefore we can stand that either there is a third cavity or it’s a tunnel that connected the two cavities and now partly collapsed. Loading all georadar data collected into a cuboid allows us to do a good interpretation: so we can follow one reflector using several sections (inline, crossline, arbitrary plane and time slice). Even if conducted following all the procedures to reduce the data inaccuracies (during the field and processing steps), where the microgravity prospecting has been tested with a station separation of 5 m, mainly in the central-west side of the area, the anomalies reflect very well the underground features, instead where the station separation was 10 m (mainly in the SE side of the area) the anomalies loose in definition and don’t depict with accuracy the aimed target. The GPR and ERT, carried out in the same areas, have reach a good resolution and they has shown a good data’s congruence. Particularly, it has been possible not only define the cavity 3876, but also it has been highlighted an unknown cavity (probably the prosecution) between the main cavities (n°3875-3876). The same profile (a) before and (b) after f-k migration. The algorithm focuses the top of the cavity and a dipping continuous reflector. A cuboid composed by four migrated sections. The strong central signal shows the cavity.